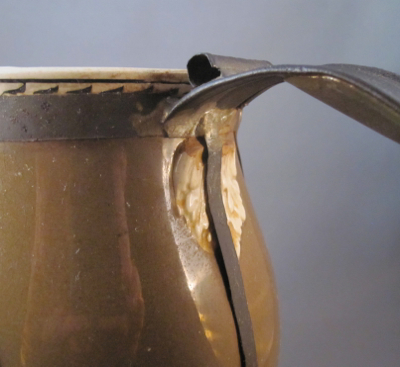 The tinsmith who crafted the metal replacement handle did a fine job securing it to the jug, by means of straps running diagonally across the ovoid form. 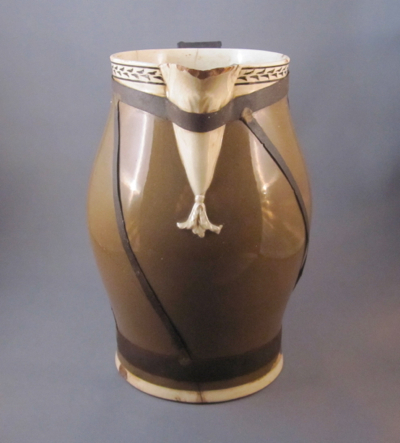 He also added a comfortable hand support, thumb rest and small curled flourish at the bottom. 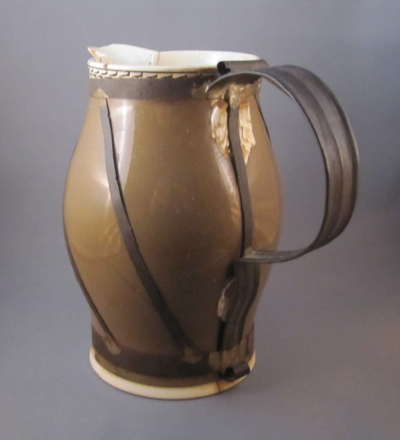 Sadly, some of the jug’s best features are covered by the tin handle, such as the intricate leaf terminals and almost half of the checkered rim. 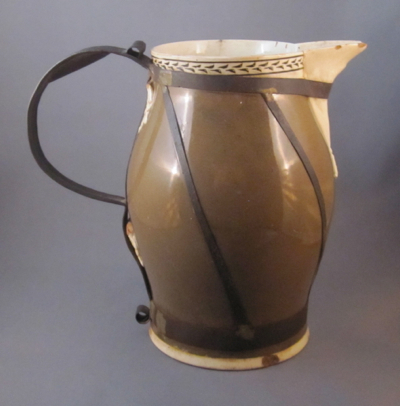 But without the added handle, the original owner would not be able to use the jug for its intended purpose and I would have nothing to write about today! 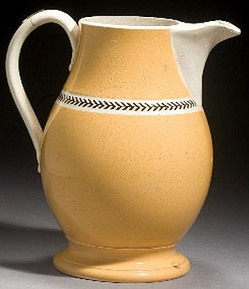 This jug with similar form and rouletted black slip-filled herringbone mid-band, shows what the original loop handle on my jug may have looked like. 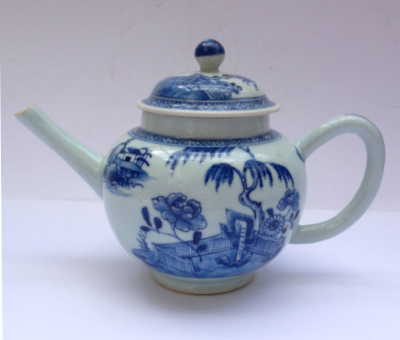 This globular shaped porcelain teapot with straight spout, loop handle and domed cover was made in China for export to London in the mid-1700s, where it was decorated with branches and leaves in cobalt blue underglaze. 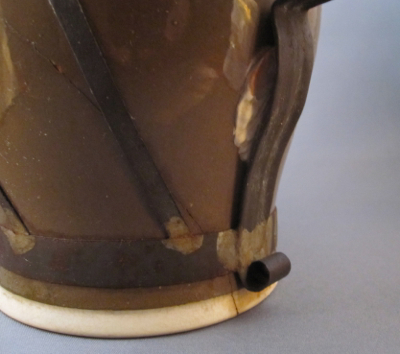 It measures 4-3/4″ tall and 7-1/4″ from the end of the handle to the tip of the spout. 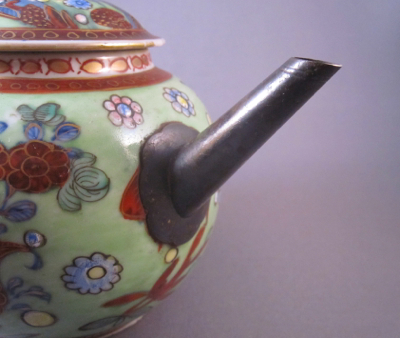 But after living in London as blue and white teapot for nearly a century, it went through a colorful transformation. 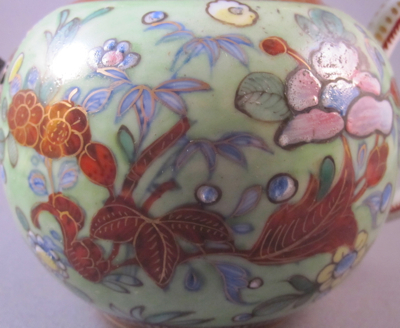 Although blue and white decorated Chinese porcelain was in high demand up until the mid-1700s, it soon fell out of favor as more colorful porcelains started appearing on the market. In trying to keep up with the sudden demand, and while attempting to get rid of the less desirable blue and white pieces, clever European merchants struck gold. 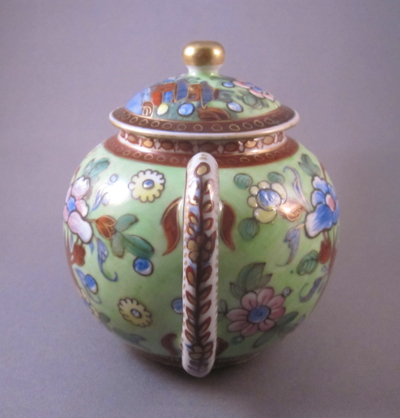 They simply painted over the existing blue and white decoration with an overglaze of additional colors. 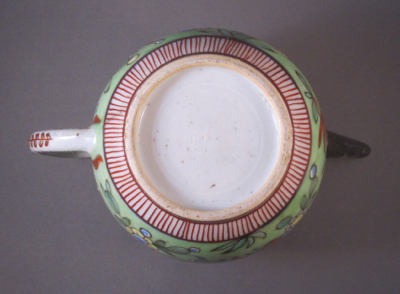 This practice, called clobbering, is also known as Amsterdams Bont when done in the Netherlands in the Imari style and palette. A translucent green wash covers most of the teapot’s surface, revealing traces of the original blue leaf decoration, now accentuated in gold. Additional stylized flowers, leaves and borders are painted in polychrome washes and heavy enamels with little regard to the pattern beneath the surface. Some artists paid more attention embellishing the original designs but on this piece you can see faint traces of the original blue peering through, like the shadow of a fish swimming in murky water. Many purists find the colorful additions gaudy and an abomination but I rather like them, seeing it as another form of making-do. 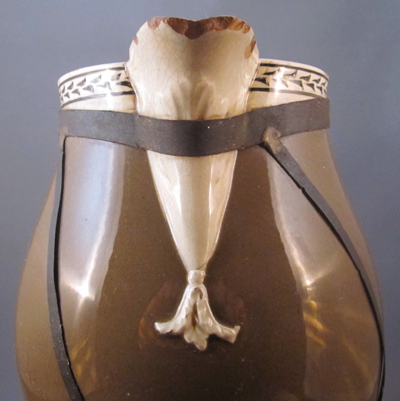 The silver spout with scalloped plate is a replacement, made in the same style and form as the porcelain original, mounted by a silversmith over 200 years ago. 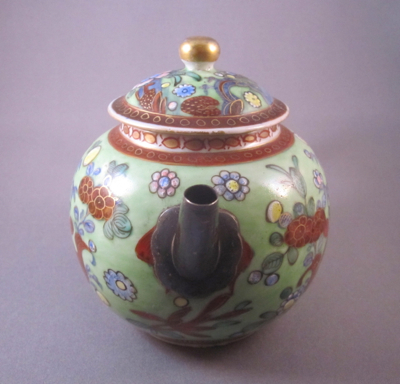 I originally listed this as an example of “Amsterdams Bont”, clobbered in the Imari style in Amsterdam. 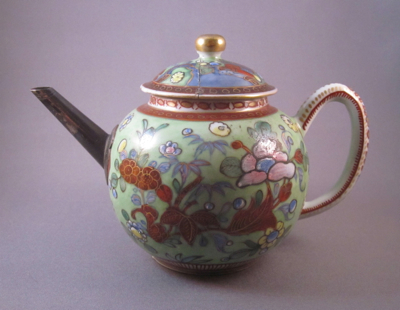 I was informed by one of my subscribers, an expert and author in the field of clobbered ceramics, that my teapot was actually overpainted in London during the first quarter of the 19th century in colors better suited for the Regency / Brighton Pavilion taste. Thank you Helen Espir for the much appreciated information. 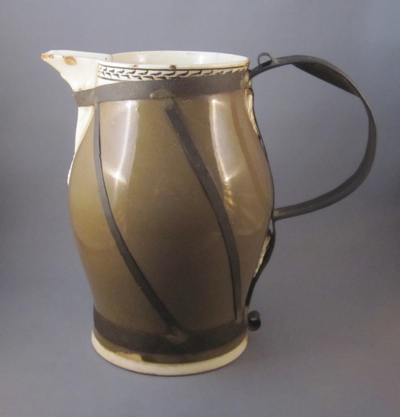 This is what my teapot may have looked like before the original spout was replaced and before it was overpainted in London, about 75 years later.